It’s cross country day at Plantation Field! Mike Etherington-Smith has laid out an impressive track to test these CIC3* combinations. The start time has been pushed back from 12:55 p.m. to 1:22 p.m. and Buck Davidson will be the trailblazer aboard Park Trader, which will be great practice before he takes it on later with overnight leader Copper Beach. Jenni reported yesterday that only 6% of starters have been able to make the time on Mike’s courses here, so each second will be crucial as we watch the top 20 jump in reverse order of standing. Follow along with the action via live stream thanks to USEF Network. Buck Davidson and Copper Beach have won the CIC3*! They are followed by Jennie Brannigan and Cambalda in second and Selena O’Hanlon and Foxwood High in third. Click here for a complete scores. Thanks for following along with us today and stay tuned for the full report to come! 12:45 p.m. EST: We’re looking forward to the start of cross country in a little under 45 minutes. Check back with us as the first horse leaves the start at 1:22 p.m. Find the order of go here. 1:18 p.m. EST: Two have withdrawn before the start – Sharon White with Cooley On Show and Buck Davidson and Park Trader. 1:23 p.m. EST: And we’re off! Jennie Brannigan and Cool As Ice are on course! 1:26 p.m. EST: Jennie looking great as she gives this young mare a very educational round. 1:29 p.m. EST: Kurt Martin and Delux Z sail smoothly through the Ruins at 8. 1:30 p.m. EST: Jennie Brannigan is the first rider home clear with just 3.2 time penalties! 1:32 p.m. EST: Covert Rights and Colleen Rutledge are off and away. They are two of the fastest in this field. 1:34 p.m. EST: Lisa Marie Furgusson and Honor Me are looking spot on today. They made the time last year – will they be the first to make it this year? 1:38 p.m. EST: Local fan favorite Erika Nesler and Right Above It leave the start box to a roaring cheer. 1:40 p.m. EST: Colleen and CR are the first home inside the time! They are in perfect form for the CCI3* next month at Fair Hill. 1:41 p.m. EST: Oh no! A stop for Woods Baughman and Montesquieu at the brush corner. 1:43 p.m. EST: Arg! Jenny Caras has a stop at the log into water with Fernhill Fortitude. 1:44 p.m. EST: Erika finishes with just 1.2 time! Well done, girl!! 1:50 p.m. EST: Francesca Broggini and Petit Bleu Marine pick up 20 penalties at 8A, The Ruins. 1:52 p.m. EST: Great save by Maya Simmons at The Ruins. Archie Rocks tapped a leg on 8A which unseated Maya, but she hung on and got it done! 1:56 p.m. EST: Phillip Dutton is making it look easy with Z. They’ve got the pedal down, so he’s definitely hunting for a clear round. 1:59 p.m. EST: A hairy moment for Phillip as Z got a little hung up on the Cordwood table at 21. Both stayed upright and continued on. 2:01 p.m. EST: 4.4 time penalties for Phillip and Z gives them the provisional lead for now on 50.6. 2:03 p.m. EST: Francesca Broggini and Petit Bleu Marine have sadly been eliminated on course. 2:05 p.m. EST: Buck Davidson is home clear with Jak My Style with 3.6 time penalties! 2:07 p.m. EST: CIC3* first-timers Cornelia Dorr and Louis M looking very professional through the first three fences. 2:08 p.m. EST: We’ve just heard that Courtney Cooper and Who’s A Star have retired on course. 2:10 p.m. EST: As predicted, Tim Bourke and Luckaun Quality are the second pair to finish double clear – 10 seconds under the time! 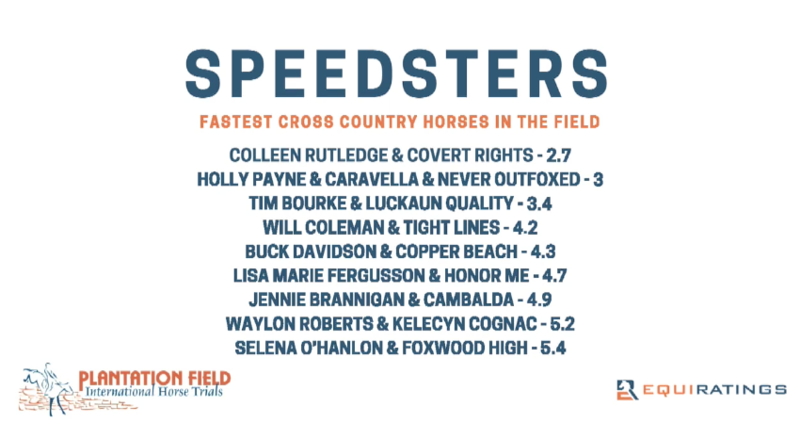 Another speedster, Holly Payne Caravella and Never Outfoxed are also on course. 2:12 p.m. EST: 7.2 for Cornelia Dorr and Louis M in their first CIC3*. We can expect even more magic from this pair in the future. 2:17 p.m. EST: 4.4 time penalties for Holly and Never Outfoxed which shows this time is no easy task. 2:20 p.m. EST: Waylon Roberts hails a cab into the water with Kelecyn Cognac. 2:22 p.m. EST: Kaitlin Spurlock pilots Cartender de Nyze to his first CIC3* finish. 2:25 p.m. EST: A few green moments for Dr. Sheldon Cooper in his first three-star, but Jessica Phoenix is doing a super job of showing him the way. 2:28 p.m. EST: A well deserved pat for El Paso as Lindsey Beer takes a very long shot to the final element of the Cheshire Hunt Conservancy Combination at 5B, but both are safe and off to the next. 2:30 p.m. EST: Arg! Lindsey Beer and El Paso have a run out at the brush corner. They take the option and continue on. 2:32 p.m. EST: Tight Lines looking very confident with Will Coleman in the tack. They’ve made the time once already at this level this year, so we are hoping they can again! 2:33 p.m. EST: Lindsey Beer and El Paso having a sticky ride through the coffin. They’ve climbed over the A element, but knocked the frangible pin for which they will receive 11 penalties. 2:34 p.m. EST: Lindsey has pulled up and retired on course. 2:37 p.m. EST: Erin Pullen has fallen at The Ruins. She was quickly up, the horse was caught and both look to be OK.
2:41 p.m. EST: Buck Davidson takes some new inside lines with Carlevo. He definitely has his eye on the clock. 2:43 p.m. EST: Revitavet Capato has thrown a shoe in warm up, so he and Jordan Linstedt will have a delayed start. Ryan Wood and Powell are on course. 2:45 p.m. EST: Fylicia Barr and Galloway Sunrise make easy work of the first five fences. 2:46 p.m. EST: 5.2 time for Buck and Carlevo. This clock is hard to beat! Ryan Wood looks like he’s taking it easy with Powell for a confident run. 2:48 p.m. EST: Dr. Kevin “Vet to the Stars” Kean leaves the box with Sportsfield Candy. 2:50 p.m. EST: All smiles for Fylicia Barr as she finishes her first CIC3*! 2:52 p.m. EST: Colleen Rutledge and UNO have a glance off at the big angled table at 5B. They are clear on second attempt. 3:01 p.m. EST: Eleventh-placed Jessica Phoenix having what looks to be a discussion with Pavarotti as he tries to take control. He is full of running! 3:02 p.m. EST: Emily Beshear and Silver Night Lady come home clear, but pick up 14 time penalties. 3:05 p.m. EST: Kurt Martin is waisting no time with Anna Bella! 3:13 p.m. EST: Despite their best efforts, Kurt and Anna Bella pick up 4.8 time penalties. Phillip Dutton and Z remain the provisional leaders as we await the top 5. 3:15 p.m. EST: We onto the top 5! Mara DePuy and CongoBrazzaville C are on course. 3:18 p.m. EST: Jordan Linstedt and Revitavet Capato zoomed through the finish to earn the third fastest round so far just .8 time penalties. 3:20 p.m. EST: Boris O’Hara home with no jump penalties and 4.8 time penalties. 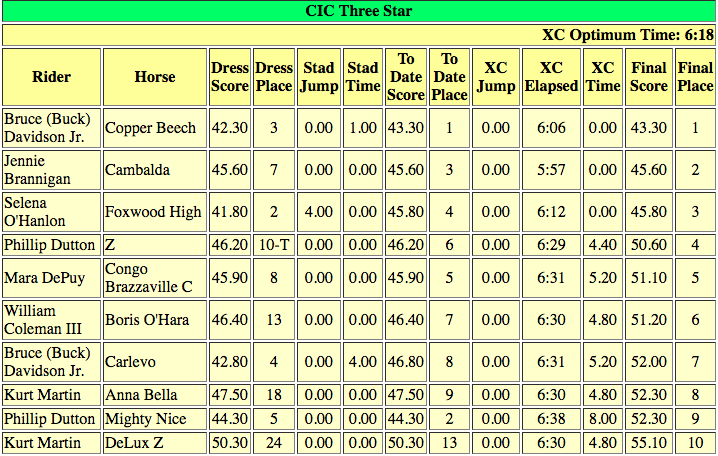 Still no one has knocked Phillip and Z off the top of this CIC3* leaderboard. 3:22 p.m. EST: Past winners Jennie Brannigan and Cambalda are quickly out of the start. She said she’s going to go for it today! 3:24 p.m. EST: Mara and Congo did accrue 5.2 time penalties, but a super result after her unlucky fall at Great Meadow earlier this summer. 3:25 p.m. EST: “Jennie looking like she’s got a plane to catch” – Dom Schramm. She certainly looks fast! But so does Selena O’Hanlon and Foxwood High. 3:26 p.m. EST: Mighty Nice on course!! His first run back since the Olympics last year. 3:28 p.m. EST: Selena and Foxwood High are the third to come in inside the time. They take over the lead. 3:28 p.m. EST: Overnight leader Buck Davidson has never won this event – here’s his chance! 3:29 p.m. EST: Jennie Brannigan redefines fast as she and Cambalda come in 21 seconds under the time – the fastest trip of the day. She moves into the lead. 3:30 p.m. EST: Phillip said he had no plans to go fast today, and they are cruising easily with two fences to go. 3:32 p.m. EST: Copper Beach pushing into a new gear. He and Buck are flying and cutting every inside turn they can get. 3:33 p.m. EST: Phillip and Happy pick up 8 time penalties – this win is now officially Buck’s for the taking. 3:34 p.m. EST: A celebration at the finish confirms it – Buck Davidson and Copper Beach win the 2017 Plantation Field CIC3*!